In the classic biblical tale of David and Goliath, most people interpret the battle as an underdog story of a feeble shepherd against a gigantic warrior. The young shepherd defeats the mighty warrior with only a stone and sling. Since then, the story has come to represent battles between underdogs and giants. Almost everyone believes that David’s victory was miraculous. But, Malcolm Gladwell disagrees. In his book “David and Goliath,” Gladwell challenges how people view obstacles and disadvantages, and shows how sometimes a person’s perceived weaknesses can actually be their greatest strength. Gladwell starts his book by reexamining the fight between David and Goliath. Gladwell argues that David actually had the upper hand in the fight for a variety of reasons. First, David had used a sling, a weapon which can hurl rocks at incredible speeds and hit targets up to two hundred yards away. David had experience with the sling, as this was his weapon of choice for fighting off lions and bears. David also had no armor, so he could move quickly and freely without any additional weight slowing him down. Goliath, Gladwell argues, was at a disadvantage because of his weight and choice of weapon. Goliath was wearing a full suit of armor, which meant an additional hundred pounds that he had to carry, and a sword. 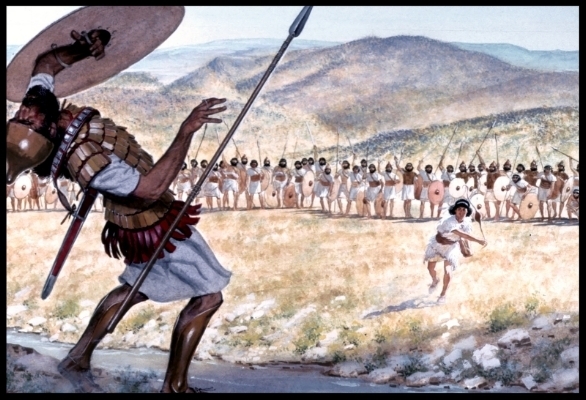 Goliath wasn’t expecting a long-distance fight, he was prepared for close-range combat. Gladwell goes through several examples of ‘disadvantages’ such as dyslexia, race, and loss of parents, and shows how certain individuals actually attribute their success in life to their disadvantages. Just as there are times when a perceived weakness can actually be a strength, there are times when an advantage can actually be a disadvantage. To make his point, Gladwell using the example of a student pursuing a STEM major at Harvard. Most people would believe that getting into an elite and prestigious school such as Harvard, instead of a liberal arts school such as Hartwick, to pursue a STEM major would be an advantage, but Gladwell has the statistics to prove otherwise. Gladwell found that although the bottom third of Harvard students had higher SAT scores than the top third of Hartwick students, the Harvard students had a lower likelihood of getting a STEM degree. The SAT scores of the bottom third of Harvard students was 581, compared to the top third of Hartwick students which had a score of 569. Yet, only 15.4% of those Harvard students graduated with a science degree compared to 55% of the Hartwick students. After pondering on these results, Gladwell realized that it isn’t how smart a student is, but how smart they feel relative to their fellow classmates. Gladwell goes on to another study that shows that the best students from mediocre schools were almost always more likely to be hired than good students from the very best schools. The world can be a complicated and complex place, sometimes one’s greatest weakness can be their greatest strength and vice versa. Although challenging, Gladwell’s book does a compelling job of explaining these phenomena through the use of history, psychology, and powerful storytelling. Thank you for reading. If you're interested in reading the book, click below!